Nowadays, it is common to find NRBQ (Nuclear, Radiologic, Biologic, Chemical) teams among emergency services. To achieve success it is very important to train a lot and to have a deep knowledge of this kind of risks. 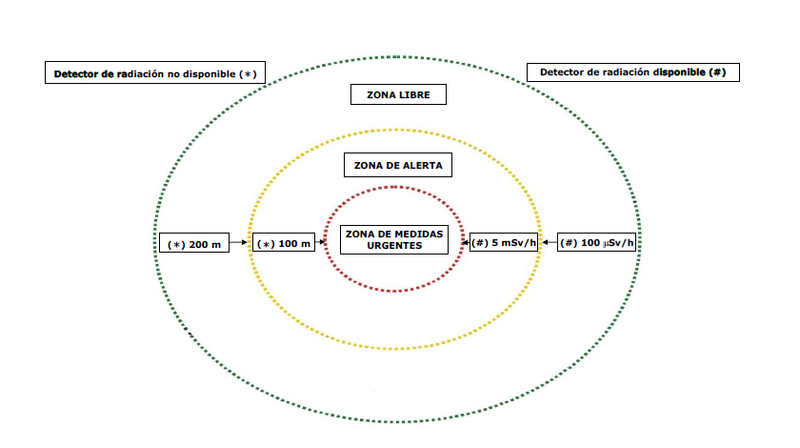 Today, in this post, I am going to talk about radiologic risk and its Spanish legislation, which is written by the Nuclear Authority in Spain (Consejo de Seguridad Nuclear). The first point to consider it is how to identify the teams which are going to manage the emergency. The NRBQ emergency teams are not going to do recuperation works, their target is the security of the citizens and save their lives (in Spain). We can find the max level of exposition for the emergency teams in the RD 1564/2010. Moreover CSN (Nuclear Security Board) advertised a technic guide to inform how to apply that legislation. Urgent actions in the accident place. The director of the emergency, through the radiological group, makes every effort to keep the dose levels of the staff below the level of occurrence of severe deterministic health effects included in Annex Table VI.5 VI. International recommendations by the CSN recommended to the Spanish Regions a max value of dose for this group in 500 mSv. Exceptionally, and to save human lives may exceed these values. The people who will do these jobs could receive higher dose limits for exposed workers laid down in RPSRI * so they must be informed, trained and volunteers and it should be excluded pregnant women. However, Table 5.5 of the CSN technical guide collects quantitative radiological criteria for implementing protective measures taken from the International Basic Safety Standars (BSS) of the IAEA (International Atomic Energy) established as a measure of protect medical advice before a new exposure or if the employee so requests in dose limit of 200 mSv. Emergency protection measures and other actions to protect the population. The emergency director through radiologic group will do all efforts to reduce the dose to the staff during the emergency below max annual dose limit for the exposure in one year requirement in 50 mSv effective dose by RPSRI. It has to be taken into account when setting the dosimeters of the staff who will intervene in the emergency. Very similar to the zones of hazardous material intervention but with different nomenclature and taking into account that the end of one and the beginning of the next is determined by the dose rate. It is the interior of the bounded zone, in which it is necessary to take certain protective measures to prevent the emergency teams of receiving higher doses than laid down in DBRR for staff intervention group 2 and to prevent the population receive higher doses than the doses established in the intervention levels for urgent protective measures. This area will include the zone where the exposure level exceed 5 mSv / h.
It is the zone in which it is necessary to take protective measures to prevent the population receives doses higher than emergency teams. This area will include the zone where the exposure is expected to exceed 100 mSv / h.
Outside the warning area, which is not necessary to apply protective measures because the doses are lower than those established intervention levels . The next figure show the definition of the areas of planning, showing the arrangement of zones and zone criteria apply in both cases. In the first moments of an emergency you may not have the means to determine the level of exposure around the stage in which it has occurred. In these cases the DBRR provides the following criteria to determine the scope and dimensions of the zones, in open spaces and indoors. Urgent measures zone will be the circle whose centre is the focus of risk and whose radius is 100 mts. Alert zone is the annulus whose centre is the source of risk and whose inner radius is 100 mts and 200 mts outside. Free zone is outside the Alert Zone. If you liked the information don't forget to subscribe and leave your comments. Compartir el post "Nuclear #3, Radiologic Risk."